Shark Lady adventures is a well-established company running since 1992. The crew are excellent will give you a memorable experience at sea. Kim Maclean, the Sharklady, has been passionate about sharks and other marine creatures since a very early age. After matriculating at Cape Town High School in 1978, Kim applied to the Department of Sea Fisheries and was accepted as a technical assistant in various sections including demersal, pelagic and southern oceans. Lady T is an 11-meter Cat. 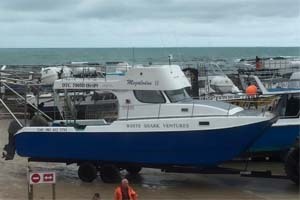 There are removable seats which will allow for large gear or wheelchairs onto the boat. 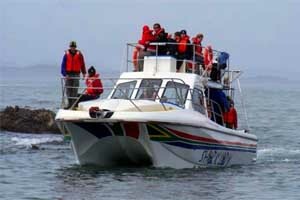 The boat takes 20 clients and 5 crew and there is a 25 man life raft as well as all the safety gear. 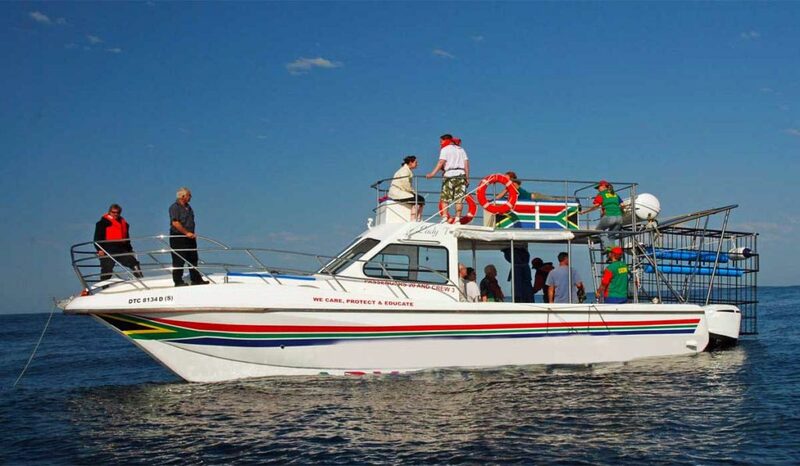 The boat is powered by 2 x 4 stroke 200 hp Suzuki out-board motors. Children only from 5 years old. No pregnant women are allowed aboard at any stage of pregnancy. 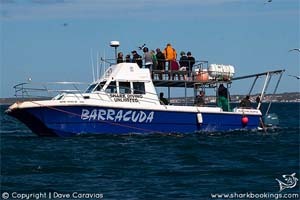 The cage is a 4 man galvanised steel cage which is tied to the side of the boat with rope. 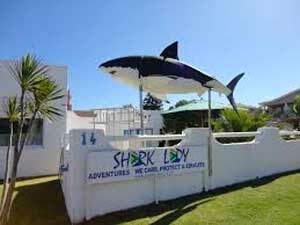 Meeting is at the Shark Lady Adventures crew house just up from the Harbour in Kleinbaai. Here you will enjoy breakfast and receiving the briefing of the day before the short walk down to the boat. 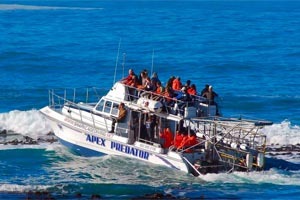 The ride to Shark Alley is approx 20 minutes where the Shark Cage will be dropped into the water and attached to the side of the boat. 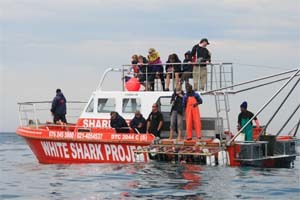 The experienced crew start fo chum the water to attract the White Sharks which are int he winter months at the Island looking for seals their staple diet. 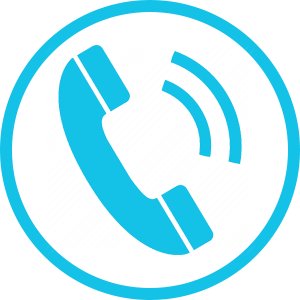 The bait consists of natural marine products such as fish oil and tuna. 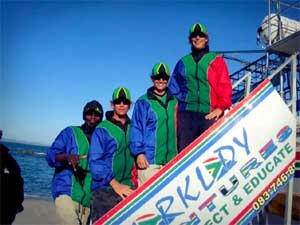 During the wait for the sharks to arrive you will kit up into the wetsuits. Depending on currents and weather we may have to wait for some time but normally it does not take long to see our first sharks. 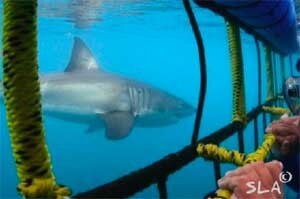 Once the sharks have arrived the divers will enter the cage. The dive master on the boat will be above the cage at all times so should you wish to get out then this is quick and easy. 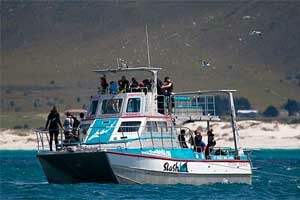 There is a top deck on the boat as with all of the shark diving boats allowing for excellent boat-based viewing. Kim Maclean has been in the industry since the beginning in 1992 and was one of the first people to pioneer the industry. 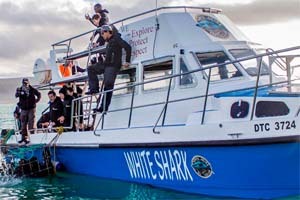 She does not go on the boat for the trips but the crew are all knowledgeable and have been working with the sharks for years.